There are over 450 churches in the UK that are dedicated to St. Nicholas. Many date from the same period - the early Middle Ages. 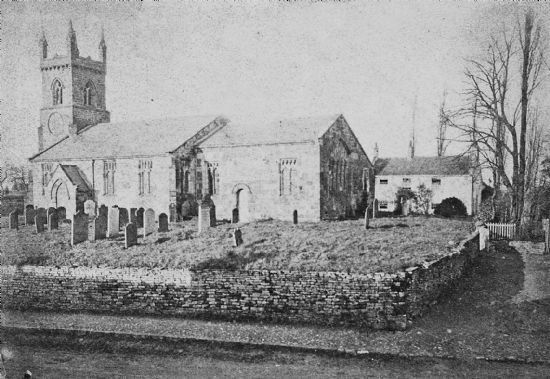 Stillington Parish Church was founded in the Mid to Late 12th Century. 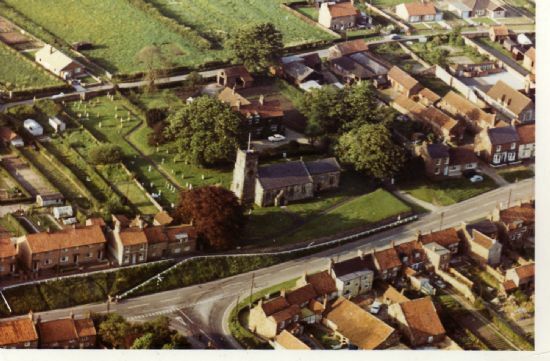 It is not known whether it replaced a wooden building, but certainly no church is mentioned in Stillington’s Domesday Book entry. A small, weather-worn statue of the saint himself probably dates from the earliest church. This can be now found in the porch above the main door. Subsequent alterations mean little else from the Norman church survives - only the moulding around the priest’s door; a sundial beside the priest’s door, with a broken off lead marker; both above and below the sundial are the remains of metal hammered into the stonework which are possibly all that it left of sconces or brackets to take a torch or lamp to light up the doorway; and inside, the font, which had been replaced during the 19th Century, but was fortunately saved and brought back into use. A few minor changes were made to the church during the 13th Century, though major alterations took place two hundred years later. After the upheaval caused by the Black Death during the 14th Century many churches were in need of repair, Stillington among them. However the building we see today isn’t how it appeared after the works of the late 15th Century. 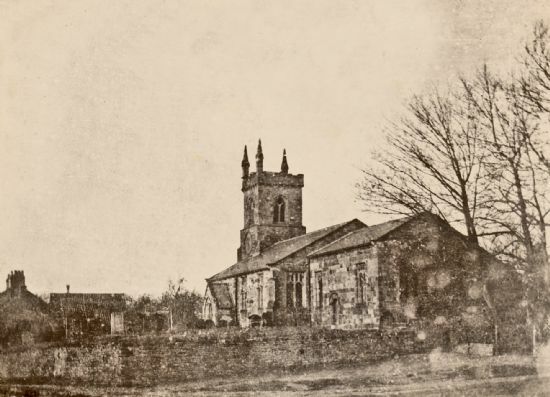 In the 1840s Gothic Revival swept through Britain and St. Nicholas’ church was caught in this tide of renewal. It is also clear from the evidence available that the fabric of the church was in urgent need of repair. A grant was received from the Diocese of York to extend and improve: Mssrs. 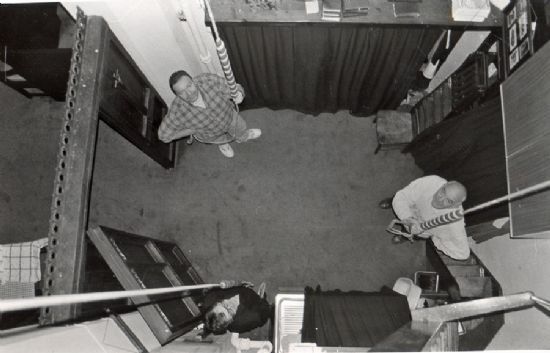 John Bownas and William Atkinson, architects, were employed to complete the works. Before and after pictures they produced show just how radical was the transformation. The entire west end of the building was rebuilt. Worshippers had passed through a porch, then beneath the tower, (probably skirting the bell-ringers as they went), to enter for services. This tower was demolished and moved to its present position, thus allowing the body of the church to be extended westwards. The roof line was simplified. The overall effect is harmonious. Much of the work was completed using the old stone. Looking the church walls carefully it can be seen where new ashlar blends in with the old. Unfortunately, even though these works was more sympathetic than others undertaken on some parish churches at the time, they somewhat fragmented the architectural history of St Nicholas’ Church. The mellow woodwork inside St Nicholas’ is mostly by Thompsons of Kilburn. The modest stained glass is mainly modern, and quite fine, so interior of the church is well lit. The rarest item is the George II Coat of Arms that hang above the chancel, a reminder to parishes of dubious allegiance that the Stuart Dynasty no longer reigned in Britain. There are war memorials listing those men from Stillington and Marton who gave their lives in the two World Wars. The World War I memorial is made of cast concrete and the one commemorating the fallen of World War II is of carved wood. If you wish to read in depth about St. Nicholas’ Church go to ‘Church Guide Book’. To read more on the clock go to ‘History of the Clock’. 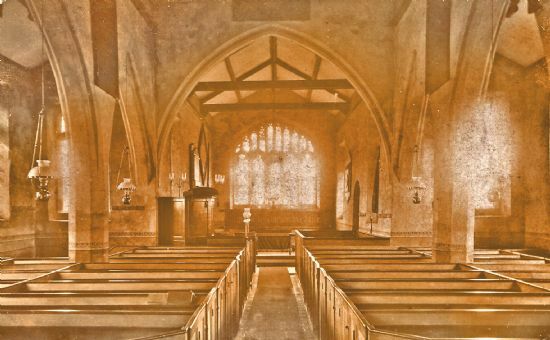 There are many photographs of the St Nicholas’ - it has always been a popular subject. Go to the gallery on this page to see a selection of the best. 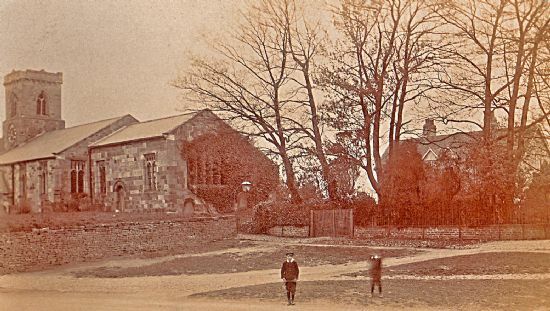 The old vicarage in the background demolished c1895. Note four pinnacles on the church tower. Only three pinnacles on tower, no Beech tree and no railings. The new vicarage can be seen in background behind the trees. Oil lamps for lighting the church and the pulpit, which stands on the right now, on the left side of the nave. 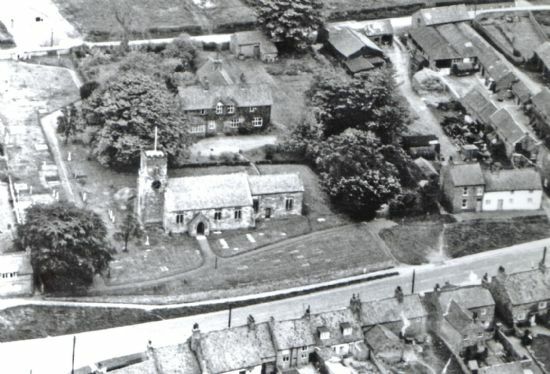 Aerial view showing no houses along North Back Lane. Aerial view showing house and bungalows along the north side of North Back Lane. 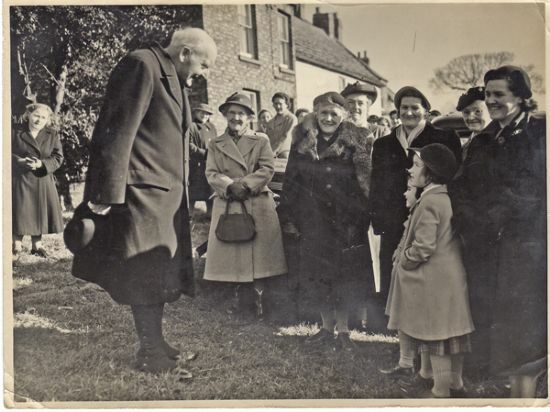 Dr Garbett, The Archbishop of York, on a visit to Stillington Church. Names of people in the adjacent picture. 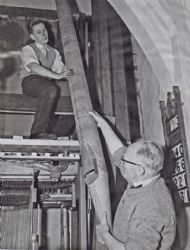 1960 The Refurbishing of the Organ. Locallad Ron Cushion carried out the work. 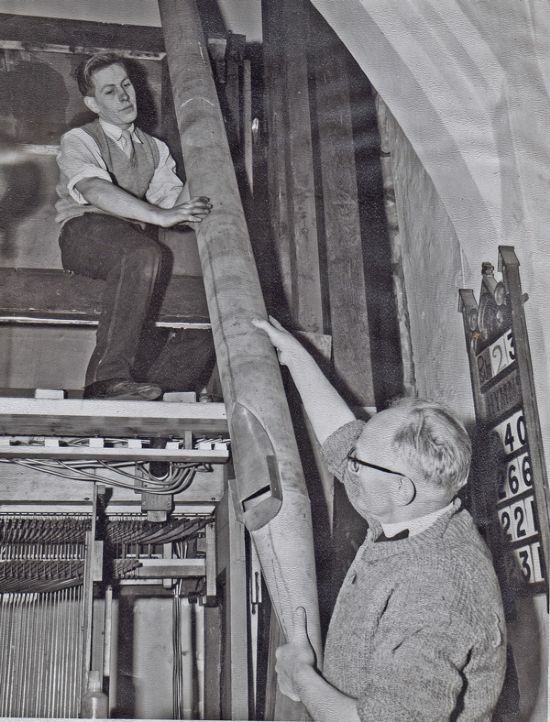 Seen here being handed an Organ pipe by Vicar W. P. Mason.